NYC hot dog staple Papaya King is turning 85 years old this year, and to celebrate, it's taking things back to 1932, with hot dogs and tropical drinks for just 32 cents today and tomorrow. The Original Combo -- two hot dogs and a drink -- only costs $5 in 2017 prices… but can you really argue with a hot dog that costs less than a dollar? 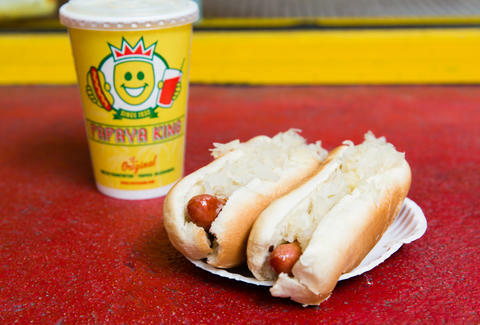 The deal is available at Papaya King's Upper East Side location at 179 East 86th St and the Brooklyn location at 6 Flatbush Ave (the St. Mark’s Place location seems to be excluded from this offer). If you happen to be in Vegas, the 32-cent deal is also good at that Papaya King location. Toppings of sauerkraut, onions, or relish can be added to your hot dog for no additional charge, but sadly, curly fries and other combo menu items won't be discounted from their 2017 prices. There are apparently also "Papaya King Brand Ambassadors" giving away free food and prizes today and tomorrow (here's hoping one of them is Rihanna). Ciera Velarde is an editorial production assistant at Thrillist and a vegetarian who wishes veggie dogs tasted the same as hot dogs. Follow her on Instagram.